Treating chronic pain is now a problem, with the baby boomers joining the senior set. The most commonly prescribed treatment for chronic pain is an epidural steroid injection (ESI). This is an injection of corticosteroid, with or without an anesthetic, directly into the epidural space around the spinal cord. 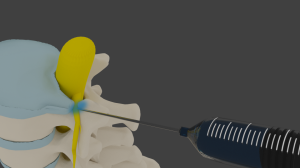 According to a recent clinical study, around 8.8 million Americans received an epidural steroid injection last year, and experts anticipate that this number will grow, since these injections are a conservative treatment before laser spine surgery. They are an alternative to laser spine surgery. They provide short-term pain relief. The injections are minimally invasive. The injections are covered by Medicare and other insurance carriers. How long does the effects of the epidural steroid injection last? Epidural steroid injections offer only modest pain relief and improvements in functional capacity. Because the anti-inflammatory effect is not permanent, you can expect 1-6 months of pain relief from an injection. This varies from person-to-person, as some people respond well and others do not. In a recent clinical study, researchers compared epidural steroids among 84 patients with lumbosacral radiculopathy of less than 6 months duration. Function and pain were assessed in patients who were randomly assigned to the treatment group. These patients received two epidural steroid injections, delivered 2 weeks apart. The medication was 60mg of methylprednisolone. For the other group, the medication was etanercept and saline solution. At one month post-injection, the pain relief rates were higher in the steroid group. Overall, the success rate was 75%, with the majority of people reporting leg pain relief of 50% or greater. These effects were noted to still exist for one month. What is the ESI procedure like? The Gilbert pain management doctor will first have you come into the office for a consultation. After determining you are a candidate for ESI, the doctor will review the risks and benefits of the procedure, and have you sign a consent form. After receiving a sedative and being positioned on the table, the skin is cleaned with an antiseptic and numbed with a local anesthetic. 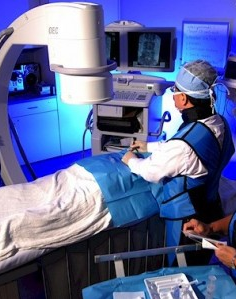 Using real-time x-ray technology, the procedure needle is guided into the epidural space, near the spinal nerves. The medication is injected, and the needle is then removed. How often can I have an epidural steroid injection? Because a corticosteroid is used, the pain management specialist will limit you to 3-4 epidural steroid injections per year. Typically, the ESI is given in a series of 3 over 3-6 months. The doctor will discuss your course of treatment at the office visit. When with the injection start to work? If an anesthetic is used during the procedure, you will have immediate pain relief. The corticosteroid begins to work after 48-72 hours, and peaks after around 2 weeks. After the ESI, your back will be sore at the injection site. This only lasts for 12-24 hours. Use an ice pack to relieve the pain. We recommend that you rest for the remainder of the day. You can gradually return to usual activities the next day. The injection site will close up soon after the injection, so no wound care is required. Dr. Ajay Yeddu at Desert Interventional Spine Consultants is the top pain management doctor in the East Valley of Phoenix metro including Gilbert, Chandler, Mesa and Queen Creek AZ. All types of interventional pain procedures are offered including several types of epidural injections, spinal cord stimulator implants, occipital blocks, nerve blocks and other procedures. Call us today to get the best pain relief possible, most insurance accepted! Mathis JM (2010). Epidural steroid injections. Neuroimaging Clin N Am, 20(2), 193-202. DOI: 10.1016/j.nic.2010.02.006.